Notion studied and named by Monge in 1785. The polar developable is called this way because the points of the axis of symmetry of a circle are called the poles of the circle (because any sphere passing by this circle is cut by the axis of the circle at its poles). cf. Lelong Ferrand Arnaudies T. 3 page 708. For an initial curve: with current point M, the polar developable is the set of all points when v describes R ; use (see the notations). The center of the osculating sphere is obtained for . If is represented by , we also get the equation of the polar line as the intersection of the normal plane and the plane obtained by differentiation of this equation with respect to t.
The notion of polar developable is the generalization to space of the notion of evolute in the plane. The polar developable of a curve is the envelope of its normal planes; since two normal planes infinitely close intersect along the axis of symmetry of the curvature circle, the polar developable is also the union of the axes of the curvature circles of the curve, i.e. the union of the lines passing by the center of curvature and perpendicular to the osculating plane (called polar lines or curvature axes). 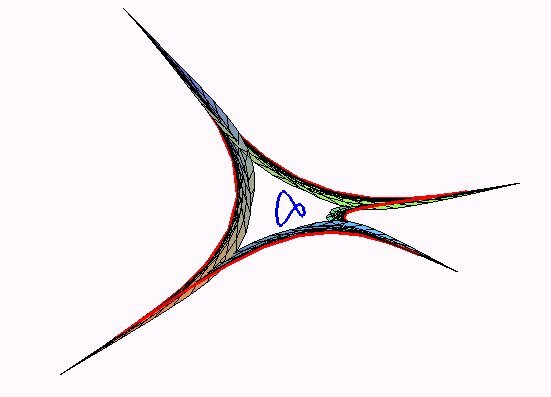 It is a developable surface that is a cylinder iff the initial curve is a plane curve (the polar developable is then the cylinder perpendicular to the curve based on its evolute) and that is a cone iff the initial curve is spherical. In the other cases, the cuspidal edge of the polar developable is the locus of the centers of the osculating spheres of the curve, sometimes called the spherical centers of curvature, or centers of torsion. 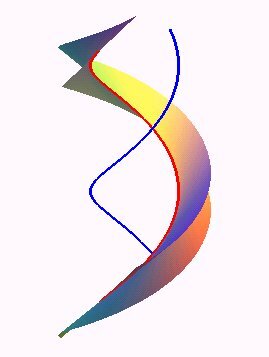 The polar developable is also the union of the evolutes of the curve, and these evolutes are geodesics (curves that develop into straight lines) of the polar developable.